Amongst innovation-driven (most developed) economies, Singapore continues to show active participation in entrepreneurship in 2014, with a consistently high Total early-stage Entrepreneurial Activity (TEA) rate that comes just after the United States, Australia and Canada. It is the attitudes of Singapore respondents that seem to serve as the catalyst for encouraging entrepreneurship in the country. Particularly, in contrast to the popular belief that Asians are more risk averse, Singapore respondents possess only moderate fear of failure, accompanied with a high level of intent to start a business. Singapore is one of the leading innovation-driven economies and the top country in the Asian region when it comes to the utilization of the latest technology, with one of the largest number of customers based overseas amongst new businesses. Local experts interviewed as part of the GEM National Expert Survey evaluate entrepreneurial financial support, government policies and its entrepreneurship programmes as the biggest enablers of entrepreneurship in Singapore. The country is ranked 1st in these conditions amongst similar innovation-driven economies. Financial and governmental support for entrepreneurship allows start-ups easy access to funding and grants. In addition, there are several entrepreneurship programmes, such as the Young Entrepreneurs Scheme (YES! ), which provides students with entrepreneurial education at secondary and post-secondary levels, and the Incubator Development Programme (IDP) which provides support to incubators, which in turn help start-ups with mentorship to guide them, as well as providing funds to develop new products and services. On the other hand, the major constraints highlighted by the experts are the costs of commercial and professional infrastructure in Singapore. Because the cost of living is very high, it is often challenging for new businesses to afford high quality business premises or professional advice. SPRING Singapore is the government body responsible for enhancing entrepreneurship in the country. SPRING has implemented various schemes, such as the Business Angel Scheme (BAS) and the Startup Enterprise Development Scheme (SEEDS), that help start-ups to access funds from early-stage investors. Additionally, the government has initiated enterprise and innovation programmes to promote entrepreneurial spirit among the youth across different age groups in secondary and post-secondary institutions. The rate of entrepreneurship in Singapore has increased considerably over the last 10 years. Whereas the TEA rate was 4.9% in 2006, it has ranged between 10% and 12% for the past three years. The main challenge for Singapore is to boost its comparatively low levels of perceived entrepreneurial skills, knowledge, experience, and opportunities to start a business in the country. Improving these would push more individuals to eventually put their intent to start a business into action, and therefore close the gap between the respondent rates of start-up intentions and TEA in Singapore. It is also important for Singapore to focus its efforts on increasing participation in entrepreneurship across age groups, especially amongst adults aged between 45 to 64 years old, who have more experience and resources to do so. Lastly, there remain room for improvement in several of Singapore's Entrepreneurial Framework Conditions (EFCs), such as its commercial and professional infrastructure and cultural and social norms. 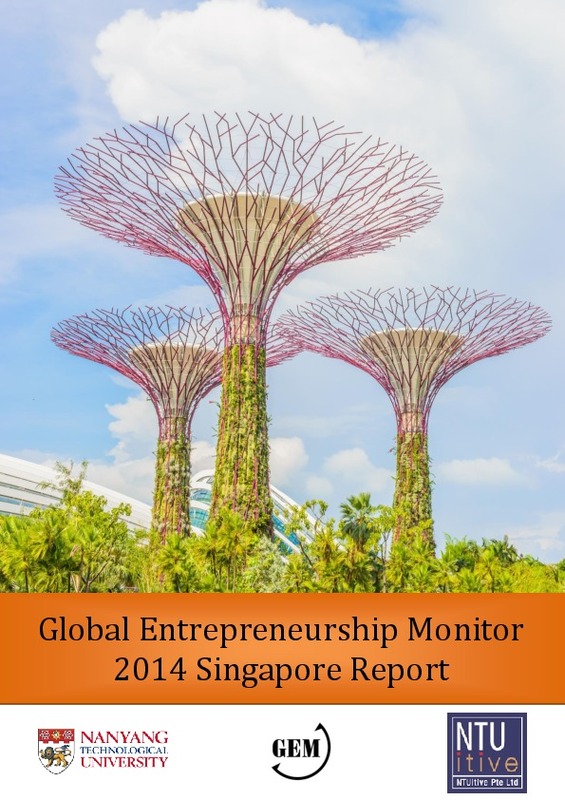 This report illustrates the current entrepreneurship landscape in Singapore, using data from the Global Entrepreneurship Monitor (GEM) for the year 2014, in comparison to those from the years 2011 to 2013. Entrepreneurial scene in Singapore remains vibrant and lively. With consistently high Total Entrepreneurial Activity (TEA) rates that remain above 10% for the past three years, Singapore continues to rank among the top few entrepreneurial nations in the world. Singapore is also among the leading innovation-driven nations to utilize the latest technology, and to have a large number of customers based overseas amongst new businesses. The Global Entrepreneurship Monitor (GEM) is the largest annual international research initiative that collects and analyses data about various forms of entrepreneurial activity, providing valuable insights into the state of entrepreneurship within and across different economies around the world. These insights are particularly relevant to Singapore, where the success of its innovation-driven financial system is largely dependent on the economic activities of its citizens. In this report, we describe the key definitions and terms used in the GEM and summarize the key findings of the GEM Singapore 2013. Wherever possible, we draw comparisons with findings from 2011 and 2012 reports, and with other developed countries or those located near Singapore. This report illustrates the current entrepreneurship landscape in Singapore using data from the Global Entrepreneurship Monitor (GEM) for the year 2012. Singapore continues to strive towards a vibrant and entrepreneurial nation. With 21.4% of the surveyed population intending to start a business within the next three years, Singapore ranks among the top few entrepreneurial nations in the world. 11.6% are currently starting or have recently started their new businesses, as indicated by the Total Entrepreneurial Activity rate (TEA) in 2012. 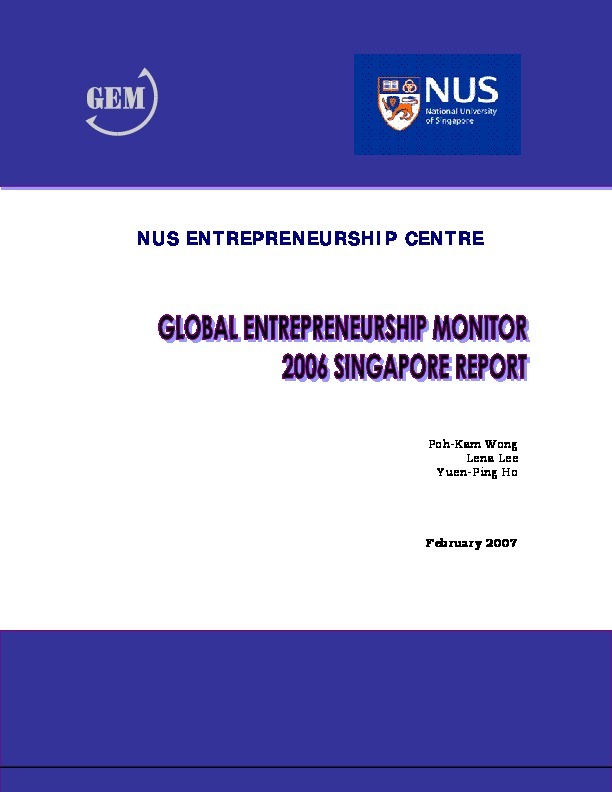 This report illustrates the current entrepreneurship landscape in Singapore using data from the Global Entrepreneurship Monitor (GEM) for the year 2011. Singapore continues to strive towards a vibrant and entrepreneurial nation. With 15.3% of the surveyed population intending to start a business within the next three years, Singapore ranks among the top five innovation-driven (developed) economies. A further 6.6% are currently starting or have recently started their new businesses, as indicated by the Total Entrepreneurial Activity rate (TEA) in 2011.